Omni Providence Hotel is in the heart of Providence, walking distance from Waterplace Park and Dunkin' Donuts Center. This 4-star hotel is within close proximity of Providence Place Mall and Trinity Repertory Company. Make yourself at home in one of the 564 air-conditioned rooms featuring refrigerators. Wireless Internet access (surcharge) is available to keep you connected. Private bathrooms with shower/tub combinations feature complimentary toiletries and hair dryers. Conveniences include phones, as well as safes and desks. Enjoy a range of recreational amenities, including a health club, an indoor pool, and a sauna. Additional features at this hotel include complimentary wireless Internet access, concierge services, and gift shops/newsstands. Enjoy a meal at one of the hotel's dining establishments, which include 2 restaurants and a coffee shop/café. From your room, you can also access room service (during limited hours). Quench your thirst with your favorite drink at a bar/lounge. Cooked-to-order breakfasts are available for a fee. 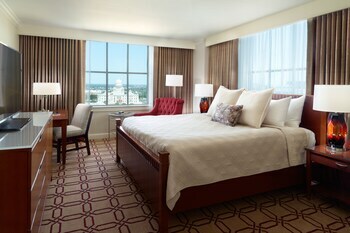 Omni Providence Hotel is an amazing Providence lodging choice for your trip to Rhode Island. With numerous amenities for guests such as 24 hour front desk, fitness center, gift shop, you will wake up at Omni Providence Hotel feeling ready to go every day for your time in Providence. Don’t let this amazing reservation opportunity pass you by, book your stay at Omni Providence Hotel today to make the most of your time in Providence, Rhode Island.